In the pediatric population, VUR is the most common indication for ureteral reimplantation. However, ureteral reimplantation with or without ureteral tapering is also performed for obstructive megaureters. Significant bladder pathology associated with high intravesical pressures and poor compliance (eg, neuropathic bladder) is a contraindication to ureteroneocystostomy. Individuals with dysfunctional voiding are at an increased risk for complications, including persistent VUR and obstruction. Performing ureteroneocystostomy in an irradiated bladder is also a concern. Ureteroneocystostomy is not recommended in patients with a history of bladder cancer. Contraindications to psoas hitch include a small contracted bladder with limited mobilization. In addition, ureteral defects proximal to the pelvic brim usually require more than a simple psoas hitch alone. Small bladder capacity is likely associated with difficult or inadequate Boari flap creation, warranting considerations of alternative methods. Also, if bladder outlet obstruction, small capacity/high pressure, or neurogenic bladder is possible, urodynamic studies should precede the operation to determine detrusor capacity and compliance. Any existing bladder outlet obstruction or neurogenic dysfunction needs to be addressed preoperatively. The ureters are paired muscular ducts with narrow lumina that carry urine from the kidneys to the bladder. The ureter is roughly 25-30 cm long in adults and courses down the retroperitoneum in an S curve. 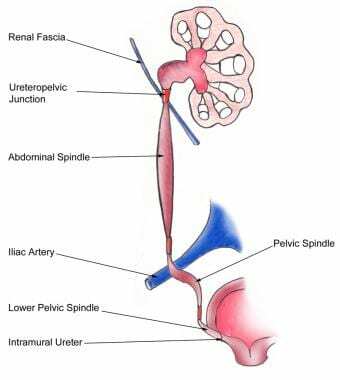 At the proximal end of the ureter is the renal pelvis; at the distal end is the bladder. The ureter begins at the level of the renal artery and vein posterior to these structures. This ureteropelvic junction usually coincides with the second lumbar vertebra on the left, with the right being marginally lower. The image below depicts the anatomy of the ureters. For more information about the relevant anatomy, see Ureter Anatomy. See also Bladder Anatomy, Female Urinary Organ Anatomy, and Male Urinary Organ Anatomy. In both adults and children, ureteroneocystostomy is performed under general anesthesia. The patient should not have an active urinary tract infection at the time of surgery. Although not routinely performed, cystoscopy may be performed initially for further evaluation of anatomy (ie, confirmation of a complete duplication) or for placement of a guidewire/stent if deemed necessary. The open procedure is performed with the patient in a supine position, with a roll under the pelvis in children and padding under the knees. For pediatric reimplantation, a Pfannenstiel incision is used, whereas a Pfannenstiel or lower midline incision is used in adults. Preoperative measures include complete visualization of the ureter and an evaluation of bladder function. Bladder outlet obstruction and neurogenic dysfunction should be treated preoperatively. The bladder capacity should also be assessed, as small bladder capacity can cause difficulty. The modified Politano-Leadbetter procedure can be approached through a Pfannenstiel or midline lower abdominal incision. Once the bladder is mobilized and the ureter identified and transected, the free end of the proximal ureter is spatulated, the bladder opened on its anterior surface, and the ureter tunneled in the bladder wall in the fashion of Politano-Leadbetter. The origin of the tunnel should be superior and medial to the native ureteral orifice, and the tunnel should be developed in the direction of the bladder neck, with a tunnel length that is at least 3 times the diameter of the ureter. If the ureter is placed in the more mobile lateral bladder, kinking may result. A double J stent is placed, and the bladder is closed in multiple layers. A Penrose drain and Foley catheter are then placed. The double J stent is typically removed approximately 6 weeks after the procedure. A catheter is placed intraoperatively to allow for filling of the bladder. 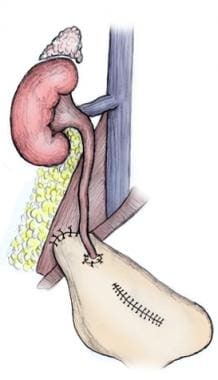 The incision is either a Pfannenstiel or lower midline unless an alternative incision is being used for renal transplantation. The bladder is moderately filled and then retracted medially to help identify the ureter. The obliterated hypogastric artery is identified and ligated. The ureter is then identified and a vessel loop placed around it. The peritoneum is dissected off of the posterior aspect of the bladder where the reimplantation is intended. The serosal and muscular layers of the detrusor are opened along a straight course cephalad and lateral to the ureterovesical junction for 4-5 cm, freeing the ureter during the dissection. The detrusor is separated from the underlying mucosa to create the antirefluxing trough. Ureteral continuity is not disrupted. The ureter is placed within the trough, and the detrusor is closed with interrupted absorbable sutures. A Penrose drain is placed in the perivesical space. The Foley catheter may be left in place overnight. In the modified Lich-Gregoir procedure, the dissection of the detrusor from the underlying mucosa is carried around the ureter circumferentially, while maintaining the continuity between the ureter and the bladder. The bladder mucosa is further freed in the region of the trigone to create submucosal flaps. 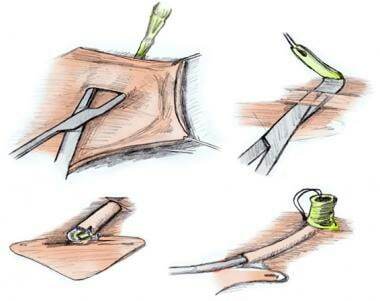 A pair of vest-type sutures of absorbable suture are placed that approximate, in succession, the detrusor at the distal limit of the dissected trigone, proximal ureter, and detrusor (inside-out) to advance the ureter into the bladder to create a new, longer submucosal tunnel. The detrusor defect is closed with interrupted absorbable sutures to recede the hiatus and to buttress the submucosal ureter. As with the unmodified version, a Penrose drain is left in place. In the adult population, a Foley catheter is typically left in place. 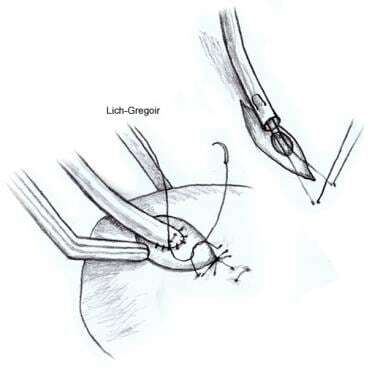 The modified Lich-Gregoir (involving detrusorrhaphy) is a common procedure performed for VUR in the pediatric population. It is more commonly performed in children with unilateral VUR and can be performed as an outpatient procedure. 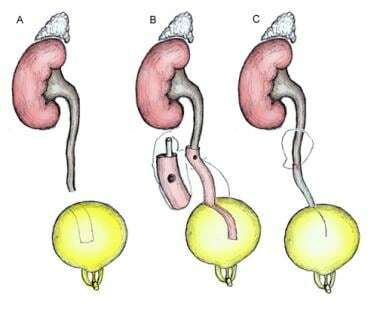 [22, 23] Modifications of the Lich-Gregoir reimplantation are the most common forms of ureteroneocystostomy used in renal transplantation. The Cohen cross-trigonal reimplantation is the most common open surgical procedure used to treat pediatric VUR. A Pfannenstiel incision is made. An anterior cystostomy is performed. The ureter is carefully mobilized transvesically, so as not to devascularize the ureter. The original hiatus is reapproximated to prevent a bladder diverticulum, and a submucosal tunnel is created so that the new hiatus is on the opposite side of the bladder. The tunnel length should be at least 4-5 times the diameter of the ureter. The anastomosis of the ureter to the bladder should be fixed securely with an anchoring stitch placed through the bladder mucosa and muscle, taking ureteral serosa and mucosa to ensure that the ureter does not retract into the submucosal tunnel. The remainder of the anastomosis approximates ureteral serosa and mucosa to bladder mucosa with interrupted sutures circumferentially. Stents are not routinely placed unless the ureter requires tapering. Placement of a Penrose drain is optional. A Foley catheter is placed at the completion of the procedure. Cohen-cross trigonal reimplantation (top images) and extravesical reimplantation (bottom images). In this procedure, the ureter is initially mobilized intravesically but is then passed extravesically before being brought back into the bladder through a different hiatus. The new hiatus is located superior and medial to the original orifice; however, it is in the normal anatomic position for later ureteral manipulation if necessary and allows for a long submucosal tunnel. A Pfannenstiel or lower midline incision can be used for ureteral reimplantation and psoas hitch. Filling the bladder prior to incision may help with the dissection. The space of Retzius is developed and the bladder is mobilized by freeing the peritoneal attachments. With traction on the ipsilateral dome, the bladder should be able to reach superior to the iliac vessels. If additional mobility is needed, the contralateral superior vesicle artery can be divided. The affected ureter is identified as it crosses the iliac vessels and is transected just proximal to the diseased segment. Placement of a stay suture on the healthy proximal ureter and careful mobilization minimizes trauma to the healthy ureter. An anterior cystostomy (vertical, oblique, or horizontal closed vertically) can be used to manually displace the bladder toward the ipsilateral ureter. The ureter is then delivered into the superolateral aspect of the dome of the bladder and the anastomosis performed, either in a refluxing or nonrefluxing (ureter placed through a submucosal tunnel) manner. The ipsilateral bladder dome is then anchored to the psoas minor tendon or the psoas major muscle with several absorbable sutures, taking care to prevent injury to the genitofemoral nerve. If preferred, the psoas hitch can be performed prior to the ureteral reimplantation. 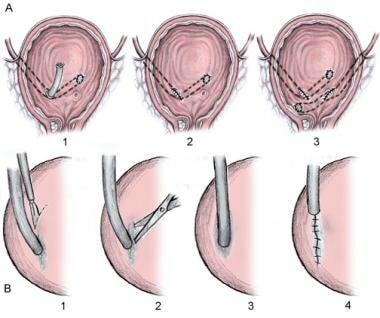 A double J stent is placed, and the bladder is closed in a 2-layer closure with absorbable sutures. The initial approach to the Boari flap is the same as that for the psoas hitch. The contralateral bladder pedicle is divided and ligated. The ureter is mobilized, taking care to prevent injury to the adventitia. The ipsilateral superior vesical artery or one of its branches is identified, and a posterolateral bladder flap is outlined based on this artery. The base of the flap needs to be at least 4 cm in width, and the flap is extended obliquely across the anterior bladder wall, with the tip of the flap at least 3 cm in width. The flap length should equal the estimated length of the ureteral defect plus 3-4 cm if a nonrefluxing ureteral anastomosis is to be performed. The base of the flap is anchored to the psoas minor tendon or psoas major muscle with several absorbable sutures, taking care to spare injury to the genitofemoral nerve when placing the sutures. The ureter is delivered through the posterior flap, and a direct refluxing mucosa-to-mucosa anastomosis is typically performed. However, if deemed necessary, a submucosal tunnel can be created in the flap and the ureter brought through this tunnel and anastomosed, if a nonrefluxing anastomosis is necessary. After the ureteral anastomosis, the tube is rolled anteriorly and closed using absorbable suture. The ureteral adventitia may be anchored to the flap. Pediatric postoperative management varies based on surgeon preference and the type of procedure performed. In the extravesical ureteral reimplantation, a drain is not routinely used and a urethral catheter may be left indwelling overnight. However, in many institutions, children are discharged home the same day. [25, 26] In open surgical procedures, a Foley catheter is often placed and left indwelling for 1-2 postoperative days. Children undergoing open reimplantation may develop postoperative bladder spasms, which are treated with oral anticholinergic therapy. Intravenous hydration for the first day or two after the surgery helps prevent clots that may obstruct the Foley catheter. Children are discharged home when they can tolerate food, are passing flatus, and have voided after the Foley catheter has been removed. Hematuria and bladder spasms are uncommon in children undergoing extravesical reimplantation, and they may be discharged home the same day or the following day, once they can tolerate food and have voided. Children undergoing bilateral extravesical ureteral reimplantation are at a higher risk of voiding dysfunction after surgery, and it is recommended that a Foley catheter be left in place longer than is typical with unilateral extravesical reimplantation. In all children undergoing reimplantation, postoperative renal ultrasonography is performed about 3 months postoperatively to evaluate for obstruction. Postprocedure voiding cystourethrography (VCUG) is not commonly performed following open ureteral reimplantation because of its high success rates but is usually obtained 3 months postoperative with extravesical ureteral reimplantation. Antibiotic prophylaxis is typically discontinued around 3 months following the procedure or after postoperative VCUG demonstrates resolution of VUR. In the adult population, a ureteral stent is more commonly placed and has been shown to reduce urologic complications in adult who have undergone kidney transplantation. [27, 28] When stents are placed in the adult population, they are typical removed around 6 weeks after the operation. Similarly, drains are more commonly placed in the adult population and are removed when the drainage ceases. As in children, follow-up ultrasonography is performed in adults after the stent has been removed to evaluate for obstruction. If urine extravasation is identified, typically by persistent output from a drain or rarely from abdominal distention related to urinary ascites, the drain is left in place (or placed if one is not present), and the Foley catheter is left in place until cystography demonstrates resolution of the urine leak. Hematuria is not uncommon after reimplantation but is typically self-limiting and rarely requires catheter irrigation. Bladder spasms are managed with anticholinergic therapy while the catheter is indwelling and after adequate bladder emptying is demonstrated (with bladder scan postvoid residual determination or abdominal palpation) after catheter removal. The bladder spasms and associated urinary frequency and urgency typically resolve by the end of the first postoperative week but may be prolonged if an indwelling stent is placed. Acute ureteral obstruction is most commonly related to edema of the bladder mucosa; however, it can result from kinking of the ureter in rare cases. If the obstruction is unilateral and the patient’s creatinine level is stable, short-term watchful waiting may be considered. Persistent pain, nausea, vomiting, and/or elevated creatinine levels should prompt stent placement. The method of stent placement varies with the procedure performed and varies from endoscopic to percutaneous nephrostomy tube placement and subsequent internalization of a double J stent. Persistent reflux is related to not achieving an adequate submucosal tunnel and/or elevated intravesical pressure. Ureteral fistula may be related to ischemia, tension, and a lack of a water-tight anastomosis. During extravesical ureteral reimplantation, if a ureteral advancement suture is being placed, care must be taken to avoid excessive angulation, which could lead to obstruction. In the Politano-Leadbetter repair, the ureter must be freely mobilized off the peritoneal reflection for 6-8 cm. Failure to do so may lead to excessive angulation. It is also recommended that this part of the procedure be performed under direct vision to avoid perforating the peritoneum, ileum, or colon. In children with VUR undergoing open ureteral reimplantation, antibiotic prophylaxis is maintained for several months postoperatively and then discontinued. In the immediate postoperative period, children undergoing open intravesical procedures often require anticholinergic agents to help the transient detrusor overactivity associated with the procedure. Modi P, Goel R, Dodiya S. Laparoscopic ureteroneocystostomy for distal ureteral injuries. Urology. 2005 Oct. 66(4):751-3. [Medline]. Wheeless Jr, CR, Roenneburg ML. Ureteroneoscystostomy and ureteroneocystostomy with bladder flap. Atlas of Pelvic Surgery (On-Line Edition). [Full Text]. Sugarbaker PH, Gutman M, Verghese M. Transureteroureterostomy: an adjunct to the management of advanced primary and recurrent pelvic malignancy. Int J Colorectal Dis. 2003 Jan. 18(1):40-4. [Medline]. Elliott SP, McAninch JW. Ureteral injuries: external and iatrogenic. Urol Clin North Am. 2006 Feb. 33(1):55-66, vi. [Medline]. Santucci RA, Williams H. Ureteral Trauma: Treatment. Medscape Reference. Available at http://emedicine.medscape.com/article/440933-treatment. Accessed: January 31, 2011. Valla JS, Steyaert H, Griffin SJ, Lauron J, Fragoso AC, Arnaud P. Transvesicoscopic Cohen ureteric reimplantation for vesicoureteral reflux in children: a single-centre 5-year experience. J Pediatr Urol. 2009 Dec. 5(6):466-71. [Medline]. Dadkhah F, Asgari MA, Tara A, Safarinejad MR. Modified ureteroneocystostomy in kidney transplantation to facilitate endoscopic management of subsequent urological complications. Int Urol Nephrol. 2010 Jun. 42(2):285-93. [Medline]. Ehrlich RM, Melman A, Skinner DG. The use of vesico-psoas hitch in urologic surgery. J Urol. 1978 Mar. 119(3):322-5. [Medline]. Steffens J, Stark E, Haben B, Treiyer A. Politano-Leadbetter ureteric reimplantation. BJU Int. 2006 Sep. 98(3):695-712. [Medline]. Mathews R, Marshall FF. Versatility of the adult psoas hitch ureteral reimplantation. J Urol. 1997 Dec. 158(6):2078-82. [Medline]. Bisignani G, Decter RM. Voiding cystourethrography after uncomplicated ureteral reimplantation in children: is it necessary?. J Urol. 1997 Sep. 158(3 Pt 2):1229-31. [Medline]. Casale P, Patel RP, Kolon TF. Nerve sparing robotic extravesical ureteral reimplantation. J Urol. 2008 May. 179(5):1987-9; discussion 1990. [Medline]. Gözen AS, Cresswell J, Canda AE, Ganta S, Rassweiler J, Teber D. Laparoscopic ureteral reimplantation: prospective evaluation of medium-term results and current developments. World J Urol. 2010 Apr. 28(2):221-6. [Medline]. Okamura K, Ono Y, Yamada Y, Kato T, Tsuji Y, Ohshima S. Endoscopic trigonoplasty for primary vesico-ureteric reflux. Br J Urol. 1995 Mar. 75(3):390-4. [Medline]. Okamura K, Kato N, Takamura S, Tanaka J, Nagai T, Watanabe H. Trigonal splitting is a major complication of endoscopic trigonoplasty at 1-year followup. J Urol. 1997 Apr. 157(4):1423-5. [Medline]. Emir H, Mammadov E, Elicevik M, Buyukunal C, Soylet Y. Transvesicoscopic cross-trigonal ureteroneocystostomy in children: A single-center experience. J Pediatr Urol. 2010 Nov 15. [Medline]. Yeung CK, Sihoe JD, Borzi PA. Endoscopic cross-trigonal ureteral reimplantation under carbon dioxide bladder insufflations for gross vesicoureteral reflux. BJU Int. 2002. 89 (suppl 2):81. Ghosh B, Biswal DK, Bera MK, Pal DK. Laparoscopic Extravesical Lich-Gregoir Ureteroneocystostomy with Psoas Hitch for the Management of Ureterovaginal Fistula in Post-Hysterectomy Patients. Urol Int. 2015 Aug 19. [Medline]. Hemal AK, Nayyar R, Gupta NP, Dorairajan LN. Experience with robot assisted laparoscopic surgery for upper and lower benign and malignant ureteral pathologies. Urology. 2010 Dec. 76(6):1387-93. [Medline]. Stefanovic KB, Bukurov NS, Marinkovic JM. Non-antireflux versus antireflux ureteroneocystostomy in adults. Br J Urol. 1991 Mar. 67(3):263-6. [Medline]. Lee RS, Bakthavatsalam R, Marsh CL, Kuhr CS. Ureteral complications in renal transplantation: a comparison of the Lich-Gregoir versus the Taguchi technique. Transplant Proc. 2007 Jun. 39(5):1461-4. [Medline]. Palmer JS. Extravesical ureteral reimplantation: an outpatient procedure. J Urol. 2008 Oct. 180(4 Suppl):1828-31; discussion 1831. [Medline]. Marotte JB, Smith DP. Extravesical ureteral reimplantations for the correction of primary reflux can be done as outpatient procedures. J Urol. 2001 Jun. 165(6 Pt 2):2228-31. [Medline]. Capozza N, Caione P. Vesicoureteral reflux: surgical and endoscopic treatment. Pediatr Nephrol. 2007 Sep. 22(9):1261-5. [Medline]. Wicher C, Hadley D, Ludlow D, Oottamasathien S, Wallis MC, Devries C. 250 consecutive unilateral extravesical ureteral reimplantations in an outpatient setting. J Urol. 2010 Jul. 184(1):311-4. [Medline]. Ashley R, Vandersteen D. Mini-ureteroneocystostomy: a safe and effective outpatient treatment for unilateral vesicoureteral reflux. J Urol. 2008 Oct. 180(4 Suppl):1621-4; discussion 1624-5. [Medline]. Georgiev P, Böni C, Dahm F, Maurus CF, Wildi S, Rousson V. Routine stenting reduces urologic complications as compared with stenting "on demand" in adult kidney transplantation. Urology. 2007 Nov. 70(5):893-7. [Medline]. Guvence N, Oskay K, Karabulut I, Ayli D. Effects of ureteral stent on urologic complications in renal transplant recipients: a retrospective study. Ren Fail. 2009. 31(10):899-903. [Medline]. Houle AM, McLorie GA, Heritz DM, McKenna PH, Churchill BM, Khoury AE. Extravesical nondismembered ureteroplasty with detrusorrhaphy: a renewed technique to correct vesicoureteral reflux in children. J Urol. 1992 Aug. 148(2 Pt 2):704-7. [Medline]. Wenske S, Olsson CA, Benson MC. Outcomes of distal ureteral reconstruction through reimplantation with psoas hitch, Boari flap, or ureteroneocystostomy for benign or malignant ureteral obstruction or injury. Urology. 2013 Jul. 82 (1):231-6. [Medline]. Schwentner C, Oswald J, Lunacek A, Deibl M, Koerner I, Bartsch G. Lich-Gregoir reimplantation causes less discomfort than Politano-Leadbetter technique: Results of a prospective, randomized, pain scale-oriented study in a pediatric population. Eur Urol. 2006 Feb. 49(2):388-95. [Medline]. Berzeg S, Baumgart E, Beyersdorff D, Lenk S, Kopka L. Late complication of Boari bladder flap. Eur Radiol. 2003 Jul. 13(7):1604-7. [Medline]. Elder JS, Diaz M, Caldamone AA, Cendron M, Greenfield S, Hurwitz R. Endoscopic therapy for vesicoureteral reflux: a meta-analysis. I. Reflux resolution and urinary tract infection. J Urol. 2006 Feb. 175(2):716-22. [Medline]. Yu RN, Roth DR. Treatment of vesicoureteral reflux using endoscopic injection of nonanimal stabilized hyaluronic acid/dextranomer gel: initial experience in pediatric patients by a single surgeon. Pediatrics. 2006 Aug. 118(2):698-703. [Medline]. Menezes M, Mohanan N, Haroun J, Colhoun E, Puri P. New contralateral vesicoureteral reflux after endoscopic correction of unilateral reflux--is routine contralateral injection indicated at initial treatment?. J Urol. 2007 Oct. 178(4 Pt 2):1711-3. [Medline].